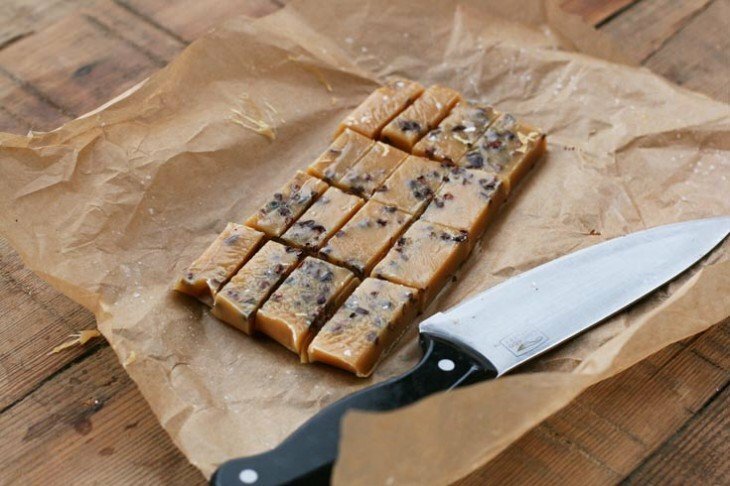 You’ll need a food thermometer to make homemade caramels. The mixture needs to reach 250F – although mine turned out great and I accidentally left them until they reached 253F. So there is a *tiny* bit of wiggle room here. But aim for 250F. 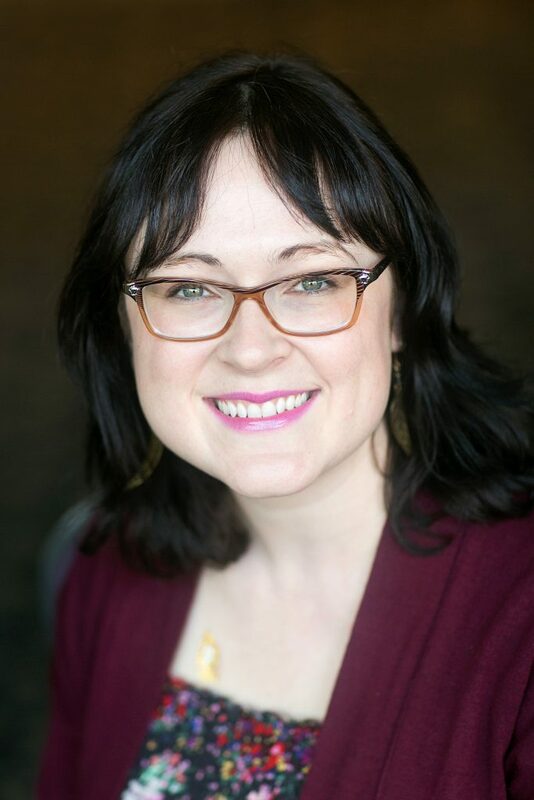 We are so very excited to introduce one of three new contributors to NellieBellie. Haley is a fellow Minnesotan, a lovely lovely lady, a talented blogger, and all-around fantastic gal. 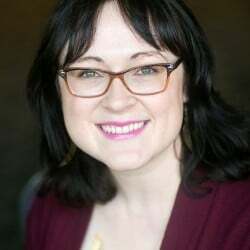 She will be bringing fantastic, inexpensive recipes that your whole family will love to our NellieBellie round-up. For us personally, we gain another friend and we couldn’t be more excited! So please welcome Haley from Cheap Recipe Blog and get a towel ready to wipe the drool off your keyboard…get a load of these caramels…yum! Hello fabulous NellieBellie readers! My name is Haley, and I write at Cheap Recipe Blog, where I share budget-friendly recipes and money-saving tips. I am joining Nellie Bellie as an occasional contributor – every couple of months or so. I will be custom picking recipes just for you. Recipes that are low cost but don’t taste low cost – if that makes sense. I’m thrilled to be able to share some ideas with you! The holidays are coming up, and you know what that means: Time to make gifts in the kitchen! Every December, I post a bunch of gift-worthy recipes on my blog – recipes that are good enough to give as a gift – but won’t break the bank. 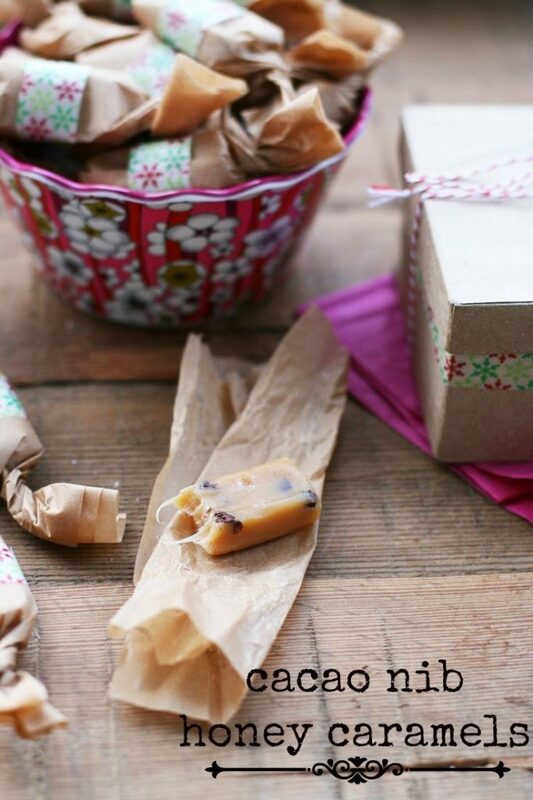 Caramels make a great gift because they last a long time – no need to eat them all in one night (but I won’t tell if you do!) I like these particular caramels because they are made with honey and not corn syrup – which I try to avoid. I added cacao nibs, which cut the sweetness just a bit and added a nice crunch. The right packaging can make all sorts of foods gift worthy. 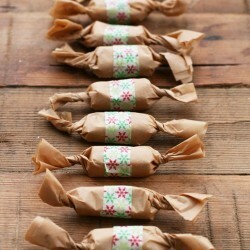 I wrapped these caramels in parchment paper and then taped them with decorative tape. 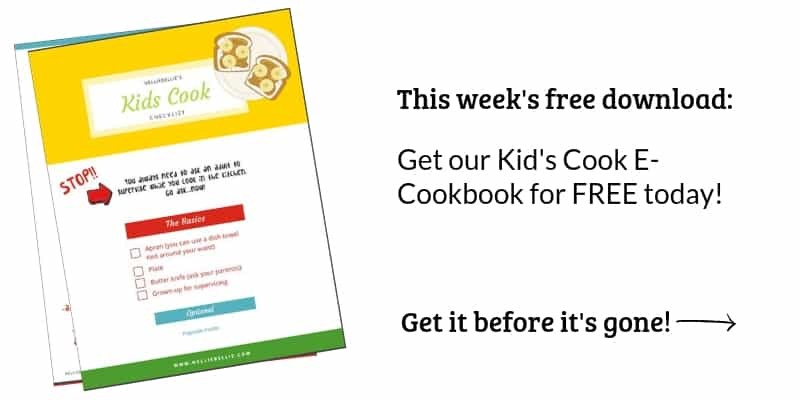 Prepare an 8x8-inch or 9x9-inch pan. Line with parchment paper and spray with cooking spray. Set aside. Spray a large, heavy-duty saucepan with cooking spray. Add butter and turn on heat to medium-high. Once butter is melted, add the honey, cream, and brown sugar. Turn down heat to medium. Let the mixture simmer, stirring occasionally, until it reaches 250F on a food thermometer. This can take 20 minutes or longer. Once the mixture reaches 250F, immediately remove pan from heat. Add vanilla. Stir in cacao nibs. Pour caramel sauce into prepared pan. Sprinkle with sea salt. Let caramels cool to room temperature. Then transfer to the fridge to cool completely. Remove caramels from the fridge and cut into desired sizes. 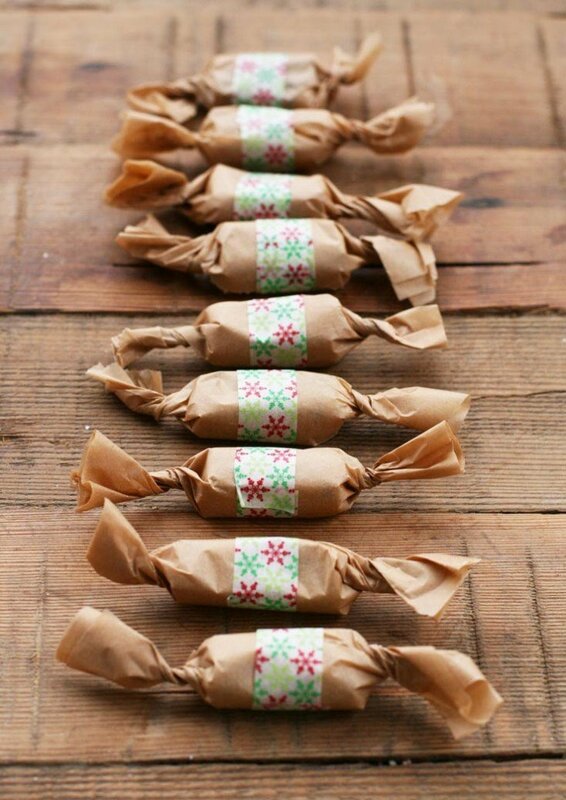 Wrap in parchment paper and fasten with a piece of decorative tape. Enjoy some for yourself and gift the rest! We get ours from the health food store…not sure if they are available at most grocery stores. You can also get them on Amazon here. This look so yummy! Putting these on my holiday food gift list! Aren’t they fabulous! Haley did such a great job with these!